Late last summer, I had an empty space in my yard. Under the living room window, behind the rose bushes, there used to be a ton of marigolds, which sounds nice, but they grew like weeds in that space and looked horrible after they finished blooming. So my housemate dug ’em all out, and there was an empty patch of dirt where they had been. That was in late August. Looking through the village to the more distant houses. A gazebo on the hill. 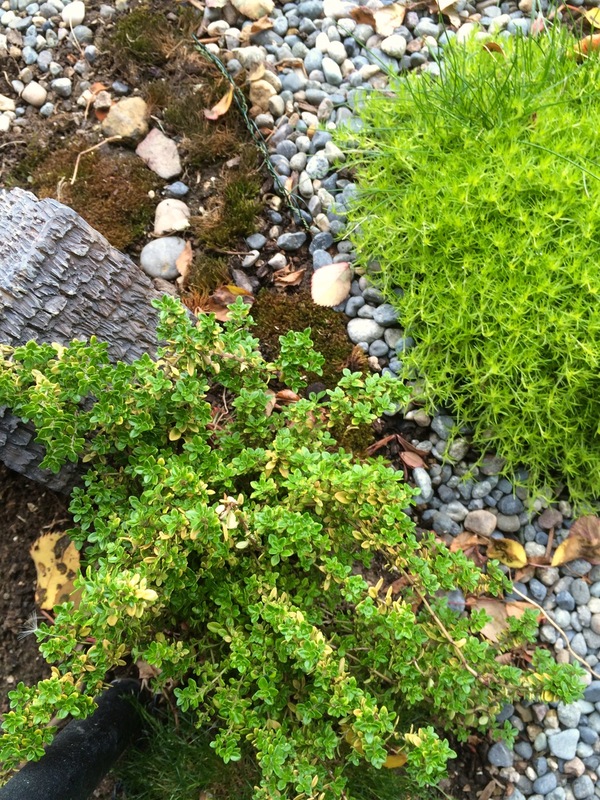 Thyme and Scotch Moss grow in the village. 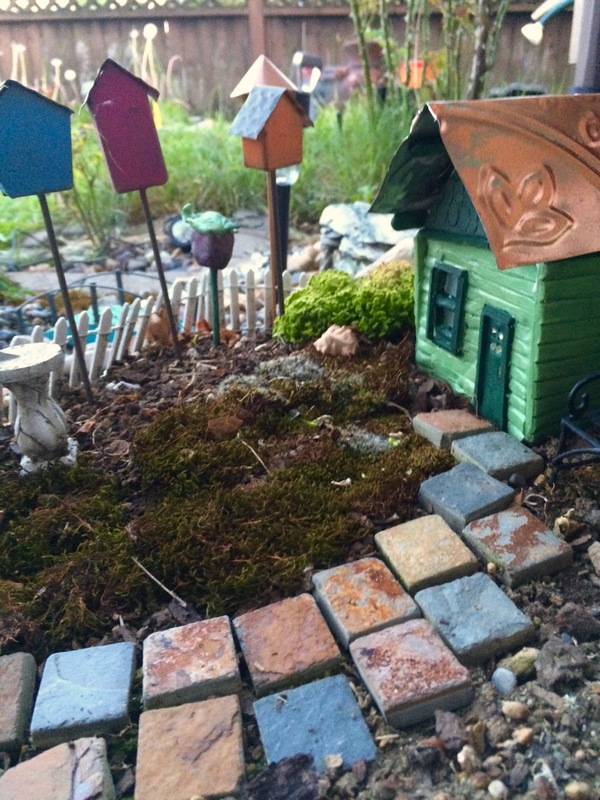 The front step of a new fairy house. There is an Airstream trailer in the village. 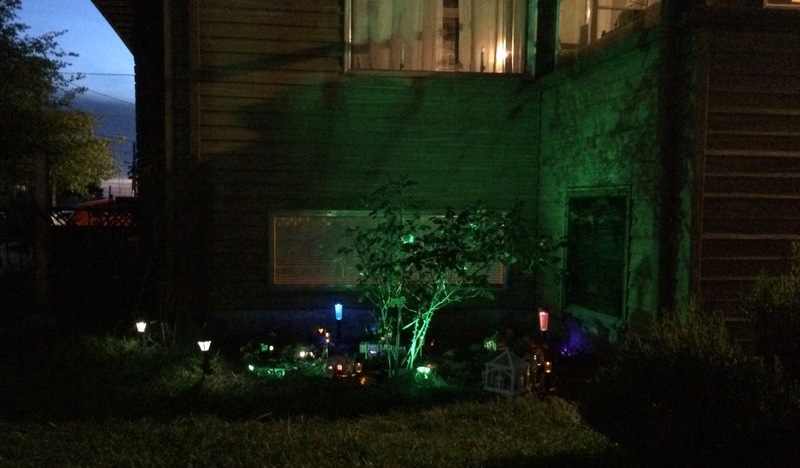 Like the other homes, it lights up at night when someone is home. Another look through the village. 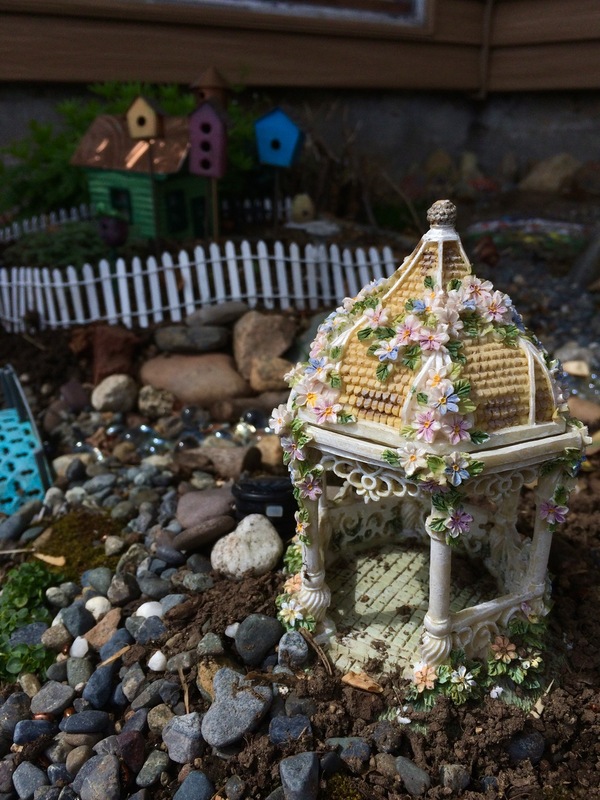 There is a house made of twigs in the background. The village lights up at night. A gazing globe outside the conservatory. It’s still a work in progress, and there are lots of things planned for it. But I’m pretty happy with it so far. 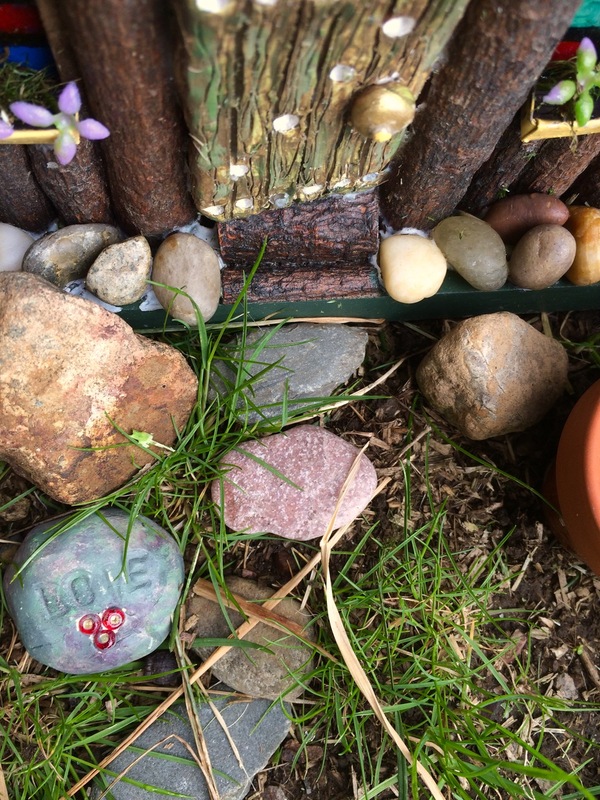 It contains a garden conservatory, a gazebo, several houses, a miniature “Airstream” travel trailer, a small “creek”, lots of plants and moss that are slowly filling in the empty spots, a cemetery, and a tiny, tiny greenhouse containing tiny, tiny seed packets, tools, and potted plants. The best thing about it is that it is solar-powered! 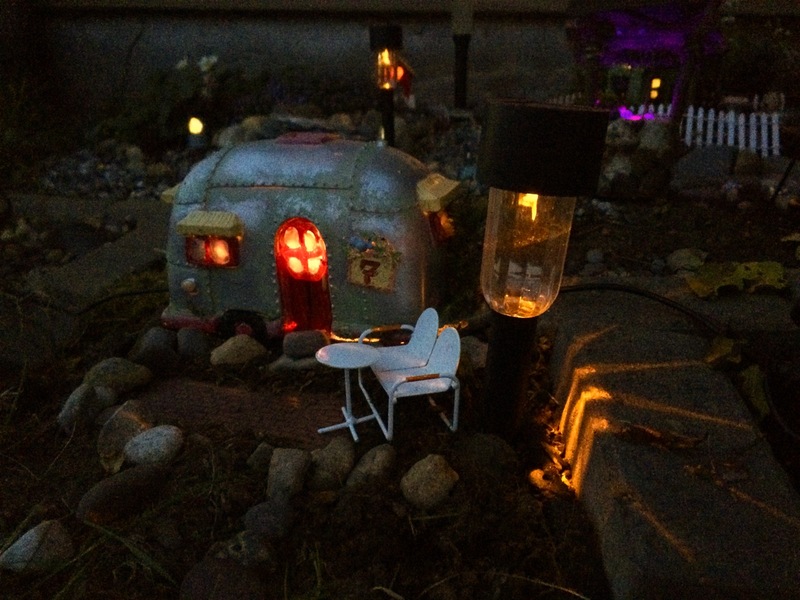 At night, the houses light up, one by one as the “fairies” arrive home. 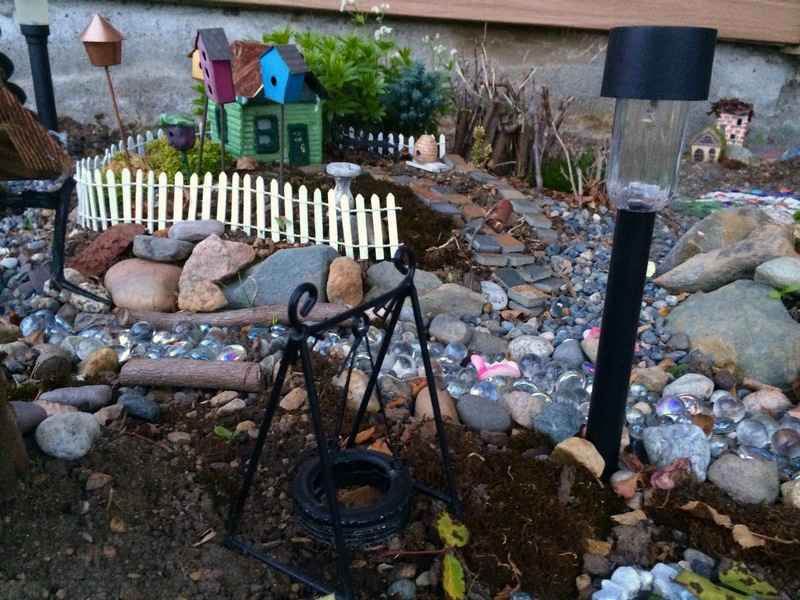 There are also some “street lights” (actually solar path lights). The second best thing about it is that doing this was cheap! 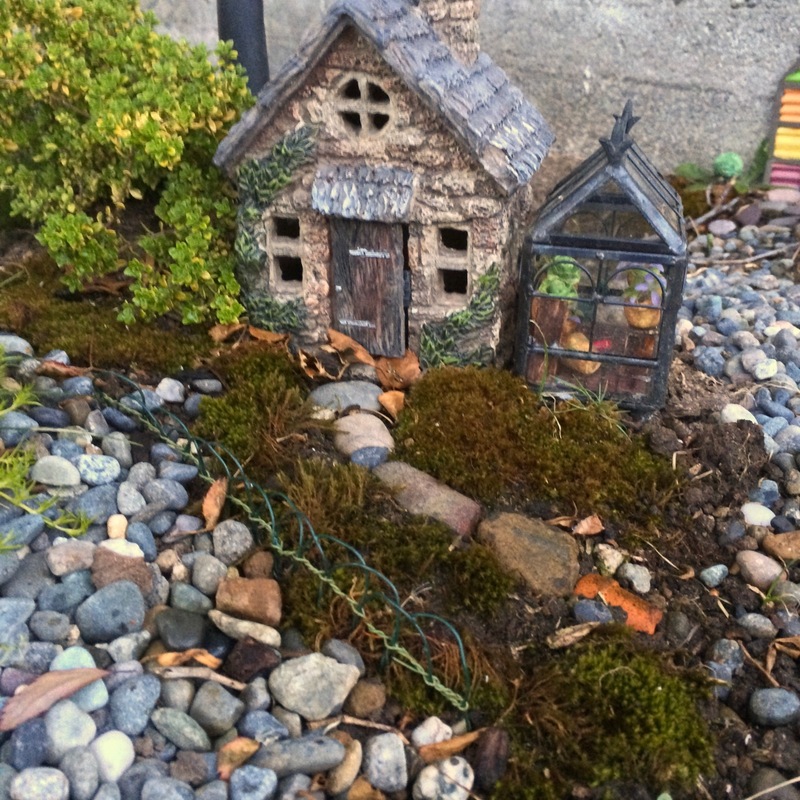 If you go to a garden center (or even Jo-Ann’s) and buy a lot of fairy garden stuff, it will cost you an arm and a leg. But most of what is in my garden I either found at Goodwill, or made myself. There are a few things that don’t fit in that category, but most of those I customized in some way as well. The conservatory building? Goodwill. The gazebo? Goodwill. 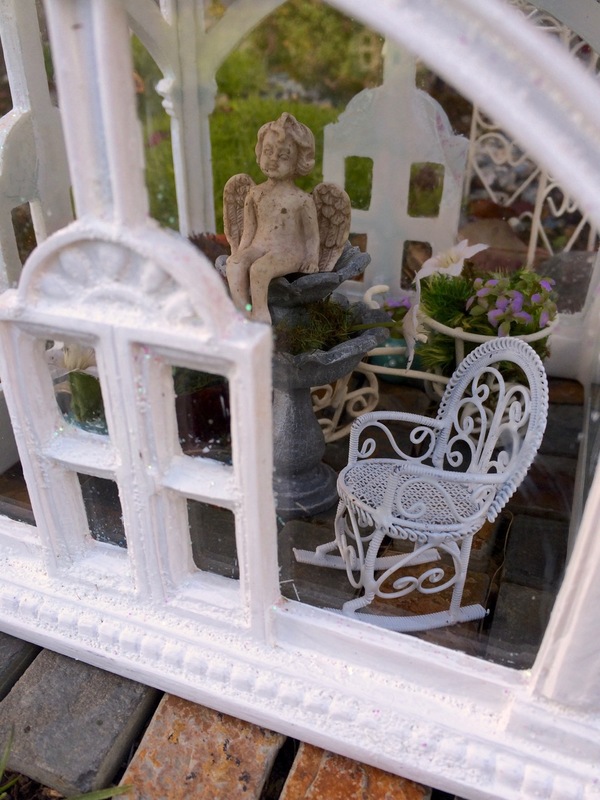 The miniature wicker-style rocking chair in the conservatory? Etsy. The greenhouse? 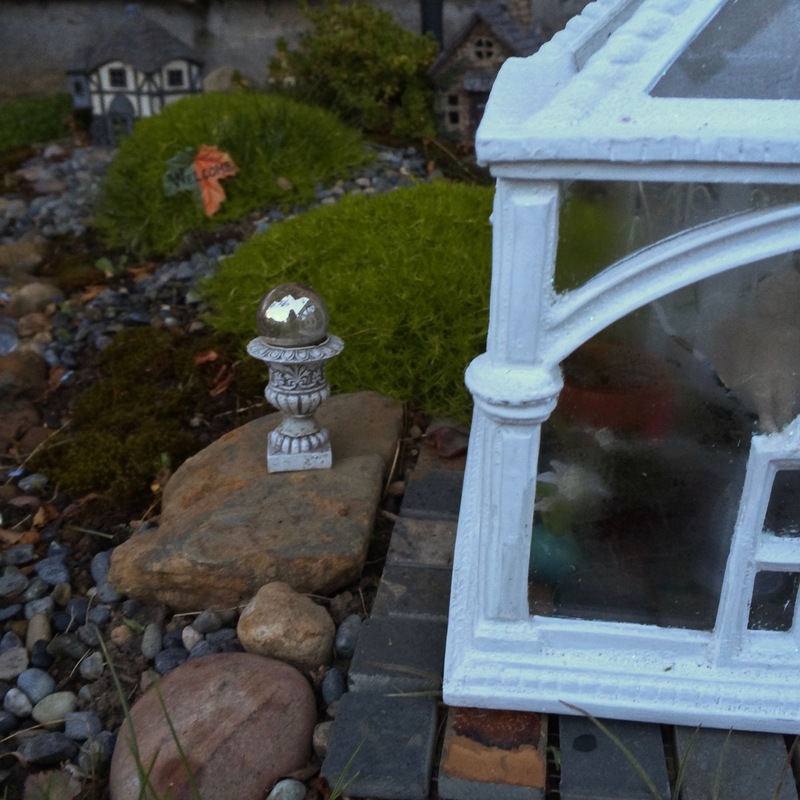 Well, I bought the tiny glass building on Amazon, but I made the furniture and accessories to go inside the greenhouse. The little green-painted house in the center? I made that out of polymer clay. The Airstream trailer? Goodwill, and it was once a birdhouse. The stone cave house? Goodwill, and it was made for an aquarium. 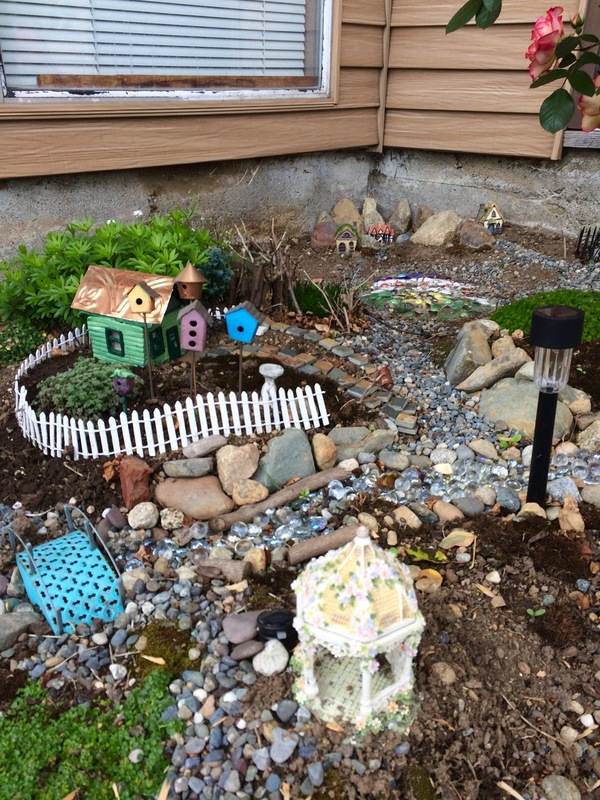 The great thing is that you can do this too, and have a fairy garden that doesn’t look like anyone else’s. I’m going to do some posts that talk about the various ways I put this together. In the meantime, I hope you enjoy the pictures. 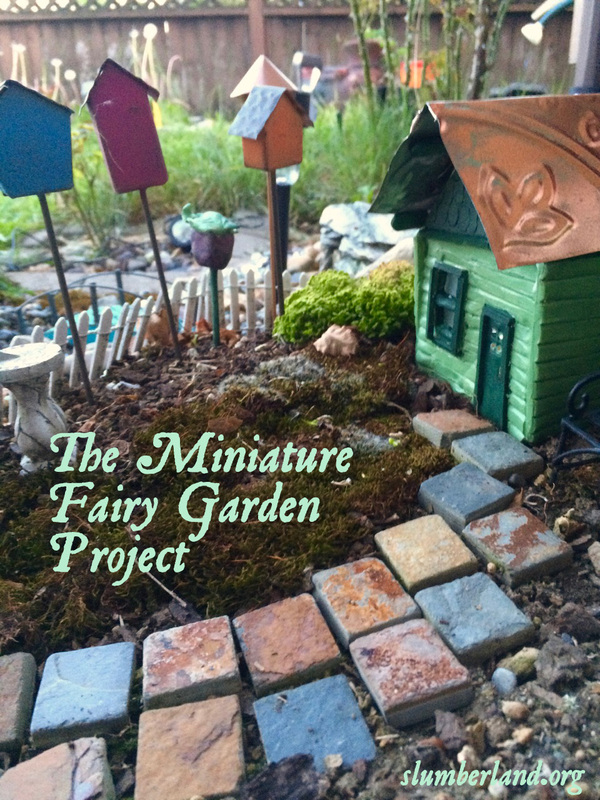 And if you are in the Seattle area, I teach a workshop on creating your own unique fairy garden. You can find out more and sign up at Verlocal. See the next post in this series here! Le Creuset is usually incredibly spendy, but the colors of the pans are irresistible. The quality is also very good. 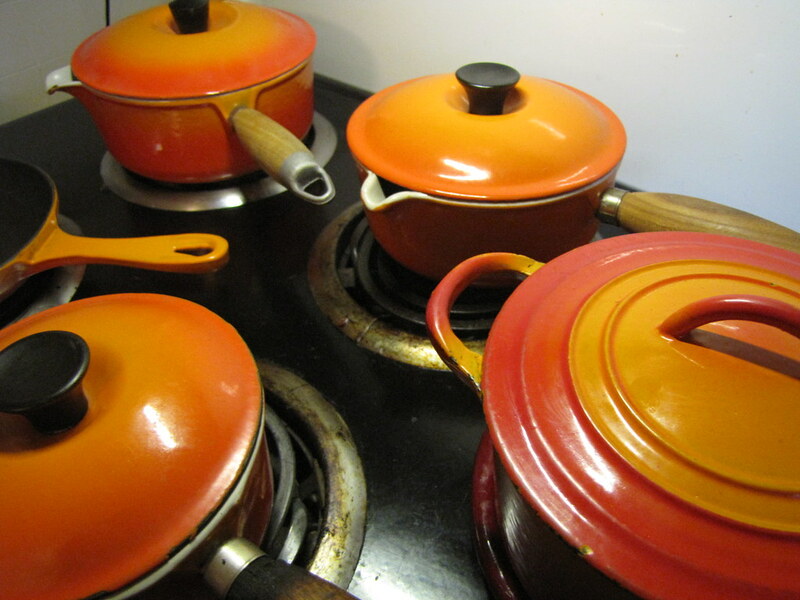 When you buy a set of Le Creuset, it’s supposed to be an investment to last for the rest of your life. You need to know that you can live with the color you choose. Many years ago, through a screaming great deal, I bought a set of cobalt blue pans as my first ever credit card purchase. I still have the tiny skillet and a small saucepan, but the rest of the set was accidentally left behind when I moved in 1992. (Someone has my pans. Please send them home.) A few years later I got a cobalt blue Kitchenaid mixer as well, then realized I didn’t want a blue kitchen any more. Oops. I decided that I don’t care if my pans don’t match each other — that having a bunch of different colors would be even more glorious. 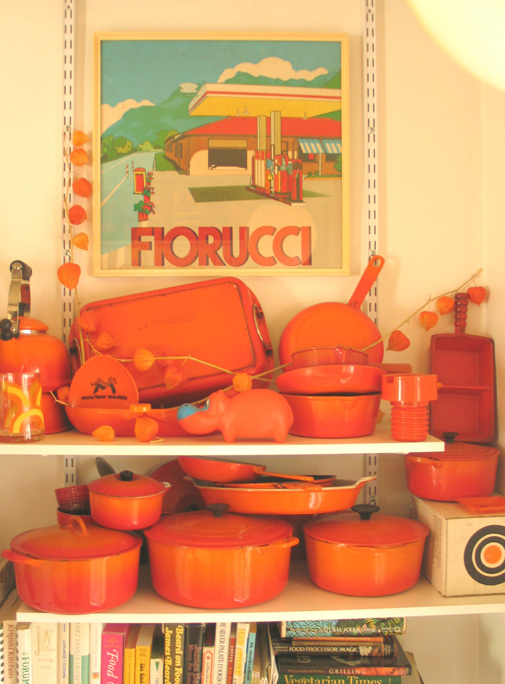 And especially if one of those colors was the original LC color, the flame orange that was supposedly inspired by the cauldron of molten iron that gives the company its name. Total cost of my three saucepans, one French oven, and an omelet pan? Well, I didn’t keep track, but I know no item was more than $15. Most were way less. However, they are from Goodwill, and some of them are closer to new than others. Two of the vintage saucepans had essentially new interiors, as does the omelet pan. One of the pans had a badly damaged handle I replaced. The small French oven has had the interior worn to bare iron somehow — which isn’t really a long-term problem since I’m seasoning it like any non-enameled cast iron pan. Most of the pans looked pretty grungy in the thrift store, which is why they were cheap. But grunge cleans off. (Uh oh. Should I be giving away the secret?) The pans really do last a lifetime and beyond, if people are willing to treat them properly. Thank you to all the folks who didn’t want to bother cleaning their gorgeous orange kitchenware, and who gave it to Goodwill for me. 😉 Keep your eyes open at the thrift stores — you have to go a lot, but you can, in good time, find some amazing stuff. I love my cast iron pans. I always heard how great cast iron was supposed to be. How a decades-old seasoning on the pan is something to treasure. How properly-seasoned pans are completely non-stick. How easy iron is to care for. And I didn’t believe any of it. My ex-husband and I picked up a humongous cast-iron pan once, and I do mean huge. One of those giant skillets that has a second handle so you can carry it without dropping it. It was a new pan, a Lodge, completely unseasoned. I don’t recall what we did to try to season it, but we did use it at some point. I think it’s possible that all we did is start cooking in it, figuring that the seasoning would then develop. Which is sort of true. But as soon as we tried to clean it, we discovered it was a pain. It started rusting quickly, and it was too heavy to use regularly, so we gave up. But, more recently, I’ve been converted. With good pans and the right treatment, cast iron is non-stick, and is incredibly easy to care for. I bet when you think of cast iron you think of a rough, rustic sort of pan, right? It turns out that modern pans aren’t like the old ones. 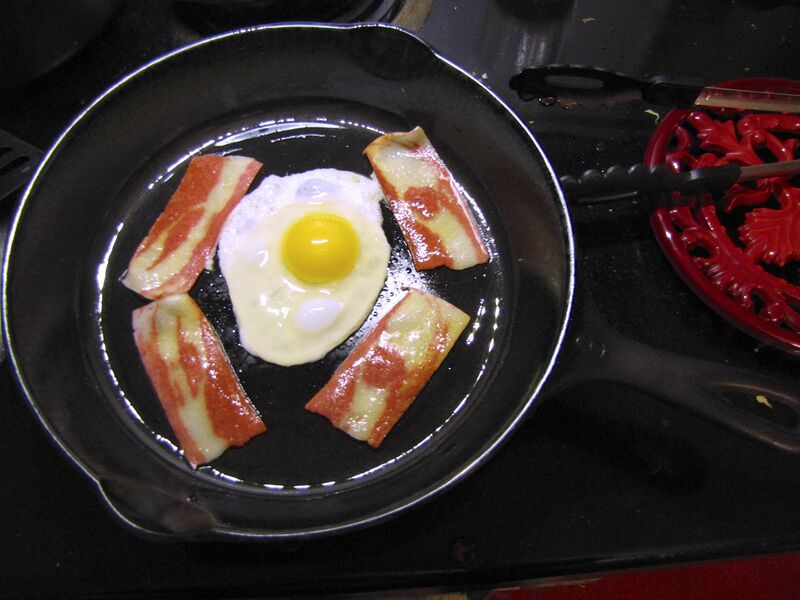 You can get modern pans, made in the U.S.A. with reasonable quality, from Lodge. Now they come with a bit of pre-seasoning so you can use them right away. They are heavy, and a bit rough. Some other pans on the market are rougher and more rustic. You can get them to be nicely seasoned, eventually. But the old pans — pre-1960 or so — they are a completely different beast. Old pans were more finely finished — machined mirror-smooth. They are thinner, so they are lighter weight. And being so smooth already, once you get them seasoned… well, they are amazing. Better than any modern non-stick pan. So I buy vintage pans when I can find them at the thrift store. Mostly I’ve found Wagner Ware. Sometimes they are so abused you can’t even tell what brand they are, but you get a nice surprise when you clean them up. Cook your awesome meal. Eggs, fish, bacon, fried chicken, deep-dish pizza, whatever. Let the pan cool a bit so you can handle it. Run hot water on it. Don’t worry, it won’t rust if it’s seasoned. Rinse out some of the crud. Wipe out the rest of the crud with a towel. If there is something you can’t get out, you can use a paste of salt and water to get it out, or a plastic scrubbie. Not one of those flat green pads. If you absolutely can’t get something out, put a bit of water in the pan and bring it to a boil. That will loosen up the stubborn crud. Wipe the pan as thoroughly as you can. Spotless. You know what you don’t do? That’s right. Use soap. “But,” you say with a look of horror, “how can I not use soap?” Here’s why and how. Dish soap is designed to cut down grease and oil. What do you use to make a good seasoning on your pan? Grease and oil. So what does dish soap do to the developing seasoning layer? It damages it. Eats away at it. You don’t want that. Instead, you wipe it as clean as possible. Run more hot water on it if you must. And then — you dry it off thoroughly, wipe it with the thinnest possible layer of oil, and set it on the burner, set to low, for seven minutes. This dries out any remaining water to prevent rust, and it also gets the pan temperature so damn hot that no nastiness can survive on your cast iron. Leave the pan on the burner until the time is up. (Don’t forget it!) Then take a clean cloth or paper towel, and wipe the pan down, removing the excess oil (there will be a bit more now that the pan has heated) and leaving an even thinner layer. You want it thin, or it might get sticky. Don’t worry, even with a very thin layer, the pan will be happy. Your pan is now ready to store. The oil you use is something that everyone has an opinion about. I seasoned my pans initially with Crisco, and I think that works just fine. But now I mostly cook with olive oil, and so that’s what I wipe the pans down with too. Olive oil isn’t supposed to be great for this, but with the technique I’ve been using, it works just fine. It does contribute to the seasoning polymer that builds up on the pan, which keeps getting better and slicker as I use it. Keep doing this everytime you cook in the pan, and pretty soon you will have what I have — a pan that is completely nonstick, that allows you to flip an egg by shaking the pan (well — it takes some practice), that even burnt teriyaki sauce won’t stick to. When you cook in it, heat the pan first, then add oil. This also prevents sticking. I heat it until drops of water tossed in it sizzle and jump around, then add some olive oil or any other oil I may need to use. Jason and I visited Goodwill yesterday to browse for interesting stuff. 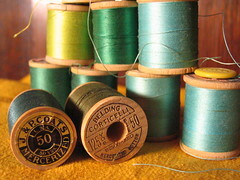 I found a bag of vintage thread; the green ones are pictured here, but there were a lot more. Almost all of them have old fashioned wooden spools, and many are unused. Some are silk thread, but most are cotton. I suppose that cutting down trees to make spools is not ideal, but on the other hand, it’s a lot more sound than using petroleum to make plastic ones that will never degrade. And these wooden ones seemed to have more reuse potential, too. When I was very young, my mom had some thread on wooden spools (I don’t know if it was already old even then), but ever since then all I have seen for sale is plastic. These are much nicer. Maybe bamboo could be used for spools somehow, which would be even more environmentally sound, and quite nice-looking too. I also found some tiki mugs, a dashboard hula girl, a (faux-)vintage tin sign, and a couple of nice salwar kameez suits I am planning to resell since they don’t really fit me but are pretty nice. Jason got a Casio SK-5 sampling keyboard, one of those late ’80s toy keyboards. I had an SK-1 myself. I got it for Christmas in 1986. They are a lot of fun to goof around with.